This Patagonia Packing List will help you to prepare for your outdoor adventure in one of the most stunning regions of South America. I created this list based on my Patagonia trekking experiences in Chile as well as Argentina in the following regions: Torres del Paine, Los Glaciares, Carretera Austral, Esquel and Bariloche. Before you go to Patagonia make sure to check out my Backpacking in South America section where you'll find loads of free guides, like trekking guides for Torres del Paine. I spent more than 7 months in South America, this list is an extension of my South America Packing List. Let's start with the essentials – a good trekking backpack is needed to carry all your stuff around. For this you should get one which is comfortable, adjustable to your body, spacious and durable. Compared to city trips you need to pack more functional clothes due to the weather conditions which can change very quick in this region. Moreover you should invest into some good outdoor clothes which are comfortable but also easy to handle. I plan for only a few days, after or in between I wash my clothes – this ensures to pack lightweight. 1x Fleece Jacket (mid layer) – highly recommended for colder parts and the evenings! Consider: I focused on the summer season, for winter you should add at least one layer and exchange shirts for warmer clothes! Take some spare dry clothes for the campsite (which you never use anywhere else than in dry surroundings!) . 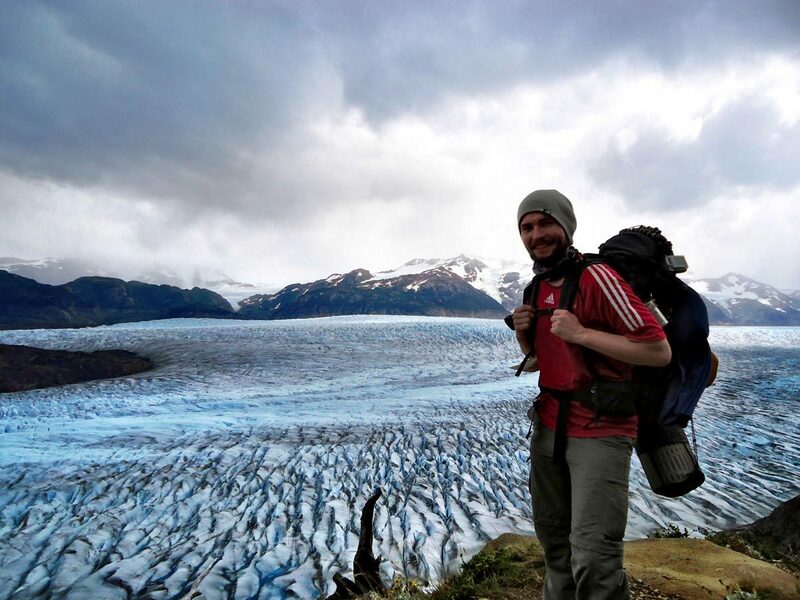 If you don't go trekking in Patagonia you'll miss out on something great – therefore following some items on this Patagonia Packing list for trekking adventures. Camping in Patagonia means to be prepared for rough weather conditions – your tent should be durable, due to the strong winds I recommend using one with aluminum poles as other materials tend to break more easily! 1x tent – the tents from MSR are high quality and come with aluminum poles, another cool option is this ultralight tent where you use your hiking poles! 1x headlamp – you will need it in the night! Basically it’s very individual what to take for a multi-day hike. My main focus was to pack as light as possible because food will be the heaviest part on the Patagonia Packing List and with this in your Backpack. All items here are optional – I used them on different treks and found them to be useful for my needs. This is a clear and concise book based on my experience from 6 months traveling through Chile. It includes travel guides for each region of Chile as well as a complete trekking guide for Torres del Paine, plus route itineraries. Checklists are included to help make sure you don’t forget anything. This guide is designed to save you a lot of time & will make your trip much easier. Download it now or buy the paperback and take it with you! This is a clear and concise 100 page eBook based on my experience from 3 months traveling through Argentina. 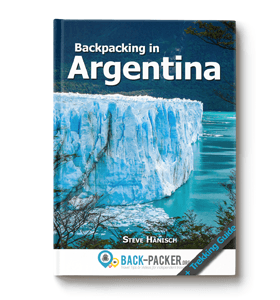 The book includes travel guides for the several regions of Argentina as well as a tiny trekking guide for El Chaltén and Ushuaia. Checklists are included to help make sure you don’t forget anything. This eBook is designed to save you a lot of time & make your trip much easier. Download it now and take it with you! I used this map to prepare my itinerary in Torres del Paine, Chile. As it is a waterproof map it is also great to use it on the trek! If you plan to hike around the argentinean trekking capital El Chaltén this is the right map to buy. It even covers the border crossing to get to the starting point of the chilean Carretera Austral in the north! 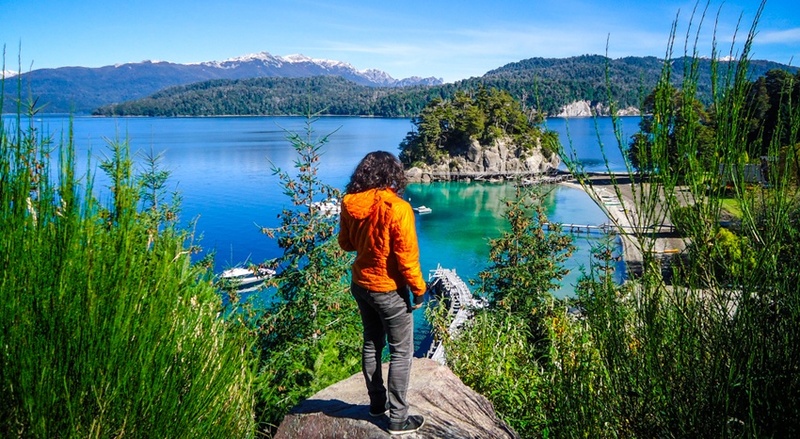 This is a must if you plan to hike a few times in Patagonia as this guide has itineraries for several parts of Patagonia and even for Tierra del Fuego. It's a good resource for the popular spots like Torres del Paine and Chaltén as well as the lesser known parts. Highly recommended! The Lonely Planet for Chile covers also Patagonia and lines out the most popular things to do, comes with small maps of the covered cities/villages and gives recommendations on restaurants and places to stay. The travel guide for Argentina covers also Patagonia and lines out the most popular things to do, comes with small maps of the covered cities/villages and gives recommendations on restaurants and places to stay. 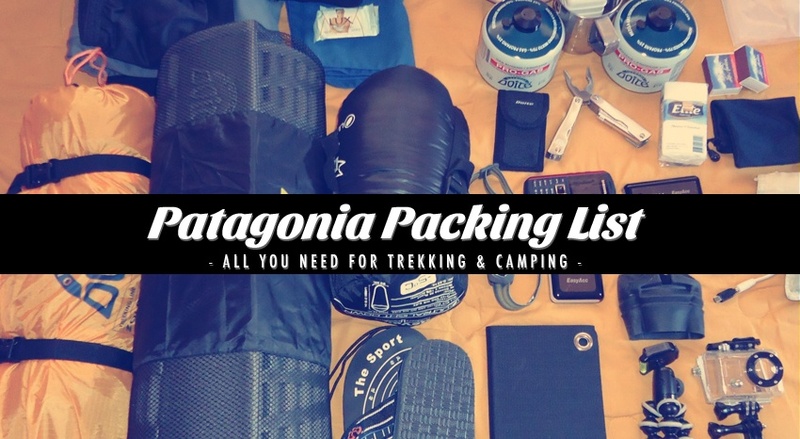 Do you like this Patagonia Packing List? Share it! Disclaimer: This post contains Affiliate Links for services and products I’m using on my travels – therefore I can highly recommend using them. By using this links you won’t pay any additional fees but support me to keep this site running! Backpacking in South America – All You Need To Know! I have a question! I’m planning a similar trip to yours, and I was wondering if you acquired all of this gear after you went to South America, and if not, how were you able to fit it all in a small backpack, as the ones you recommend on your SA packing guide? I got some of the stuff down in Patagonia but would recommend to buy it before. I used straps to attach my tent, mat and sleeping bag to the backpack. I bought cooking gear down in Chile and ditched it once I left Patagonia (I gave it fellow backpackers who were at the beginning of their Patagonia trip). Hi Steve – I’m planning my trip to El Calafate and El Chalten in January and I’m considering on buying all my equipment in Germany before heading there. But I was wondering if there’s anything worth considering to rent in there, specially bulky things (like sleeping mat and bag, etc). Also, any recommendations for the hiking boots? mid or high cut or maybe even good running shoes? Super advice all over, there is only one thing that you understate. Taking dried or freeeze food in Chile seems to have become merely impossible over the years after increasing border patrol. Therefore all stuff should be bought in Puerto Natales. We found this out after buying a 100 dollar worth of food.So food food food buy it IN Chile, not before. Thanks for pointing this out – luckily this doesn’t apply to Argentina. But even in Chile it varies and depends on the ingredients. It is best to check with the authorities before you buy this kind of stuff. good sleeping bags which are also lightweight will always end up costing a lot of money. For Patagonia I always recommend getting at least a sleeping bag which goes down to -5°C as the comfort zone is different (mostly only until 5-0°C). The max temperature printed on sleeping bags are the “extreme temperature” (which means you wouldn’t feel comfortable but you wouldn’t die). It always depends on the time of year and where you go. Patagonia is diverse – you can sleep in a valley where it is much warmer or you camp out next to a glacier. If you are limited with your budget you could consider renting a sleeping bag (e.g. Puerto Natales) for that specific hike or staying at refugios. For a 2 day hike I’d suggest getting sandwiches, müsli bars/nuts and fruits, no need to cook. But in your case you are doing the circuit, it could be nice to cook some warm meal – you can rent cooking gear in Pto. Natales as well. Hi Steve, I see you’re recommending the hiking pole tent? Do you think it’s feasible with those winds? Did you see anyone using such tent? Hi Steve – thanks for sharing the great write up. I will be doing the W trek in March with some photogrpaher friends – we have the package tent and food deal (but I’m bringing my own nice down bag and extra tent spikes!) How much “cash” did you recommend for the W once you leave Punta-Natales Id imagine no ATM machines. If most our food is covered – I imagine the fees/beer and snack money – and maybe some tips for local service providers? Also – it looked pretty chilly when you were there – are there any bugs/mosquitos to need spray or too cold and windy in March?